“In commemoration of the seventy _ time of the Black Crook. 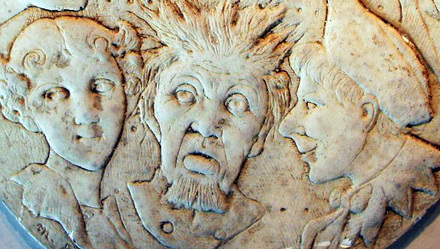 The Boston Theater on Wednesday November eighth MDCCCXCIII .” Cast plaster. Graphic Arts GAX 2012- in process. The Black Crook opened at the Boston Theatre on September 4, 1893 and played until January 6, 1894. At that time, eighteen weeks was the longest consecutive run of any Boston Theatre production. The original 1866 production of this 5 1/2 hour musical comedy ran for over 2 years in New York City. It’s success may have been due to the 100 “scantily-clan” female dancers. Nearing the seventieth performance at the Boston Theater, a celebrate was arranged. 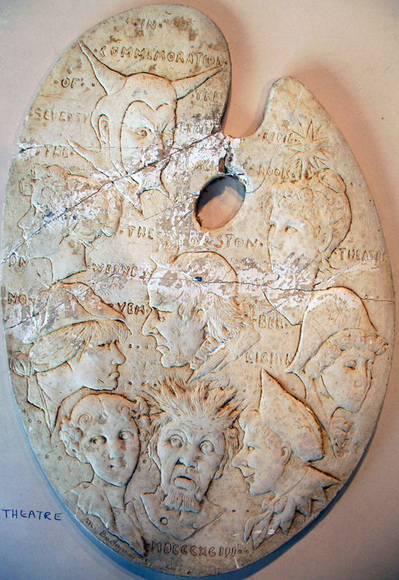 The Boston sculptor Max Backmann was commissioned to create this commemorative souvenir: an artist’s palette with the actor’s faces as the painter’s colors. These songs are released under a Creative Commons BY-NC-SA 2.0 license. This means you can download, share, and remix the files as long as you credit the original artists, do not use them for commercial purposes, and license any new work you make with the audio under a similar license.